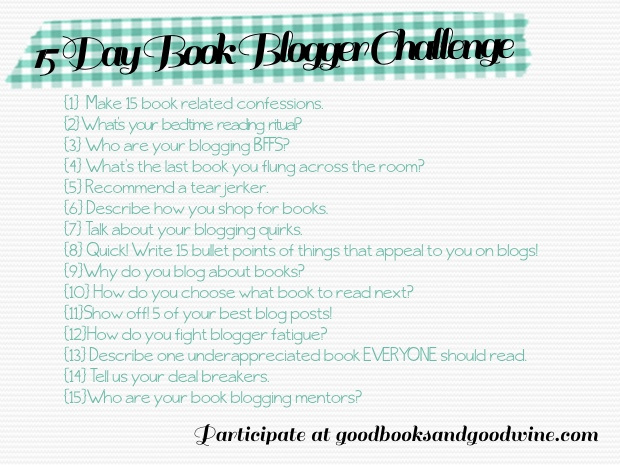 So this is a book blogging challenge hosted by Good Books, Good Wine. It’s basically a genius idea to help us all confess our weirdness for other weird people to see. AWESOME! Today I am talking about my bedtime reading ritual! First of all. I’m a little creeped out that everyone seems to know that I have a bedtime reading ritual. Seriously. Kidding. I don’t really have ritual. I get in bed. Turn on kindle, flip the light on and READ. However, if I am reading an actual book. Like a real book with paper and everything, then I get into bed and count down the seconds it takes my daughter to go to sleep. Yes, I am one of those horrible parents that sleeps with their kid. (You have no idea how good she is at cuddling!) Once she is asleep-asleep I flip the light back on and I am home free. She sleeps like a log. 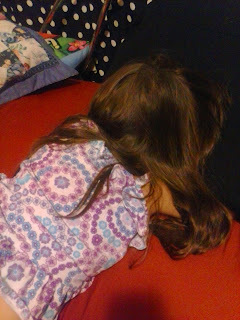 Actually, it’s currently 1:26 am and she is sleeping next to me as I blog this. No I don’t use one of those dumb little book lights. I bought one once and it gave me the worst headache. I do use a kindle light though…. Yes I realize I have issues. I do prefer to read on my stomach with a pillow propped underneath me, and one holding my kindle/book up. I’m not really a fan of dropping them on my face. I don’t fall asleep while reading. I actually some how manage to turn the kindle off, or dog ear my page then fall asleep. It’s magic. My mom however, does fall asleep while reading. I can’t tell you how many times over the years I have walked in her room to find her sleeping with a book on her face…..I have yet to find her with her kindle on her face. It must be too heavy? I’ll have to ask her tomorrow (later today) if she sleeps with it on her face. So there you have it. My not so weird nightly reading ritual.